Joseph Loewensteins goal in this book is clearly stated. It is to describe the fragmentary and eruptive emergence of what I have elsewhere called the bibliographical ego, a specifically Early Modern form of authorial identification with printed writing (p. 1). Such identification, he argues, is deeply tinged with possessiveness, and especially so in the work of Ben Jonson. The accusations of plagiarism and other manifestations of jealousy that we find everywhere in the Early Modern period are the product of competition exacerbated by printing methods and the attempts to achieve monopolistic control among Londons acting companies and the Company of Stationers. 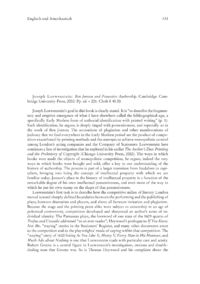 Loewenstein here continues a line of investigation that he explored in his earlier The Authors Due: Printing and the Prehistory of Copyright (Chicago University Press, 2002).